Club Penguin Cheats by Mimo777 Club Penguin Cheats by Mimo777: Club Penguin EPF Message From Jet Pack Guy! 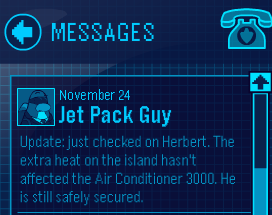 Oh, good thing Herbert is secure, huh? Its not that but I got a cheat! If your an agent, walk up to the VR room and click on the PSA missions, (Its blue) then click missions in the corner. You will see a flash!! !